I make two kinds of box tops. and attached tops where the top is glued directly onto the sides of the box. This tutorial will feature the attached top method, and a press design to help with this process. Of course you can use clamps to hold the top on until the glue sets. But I prefer this press. The press features 8 all-thread sections with a compression spring and plastic pipe around the all-thread at each corner. The springs are meant to hold the press open so you can place a box inside without having to fight with the press. So in this box the splines were glued in, the top has had glue applied and has had the rough top set on the box. To save time I often will install the splines and add the top then I can let both of them cure at the same time. Now it gets set into the press and then I use an impact driver to tighten the nuts and apply even pressure to the top. 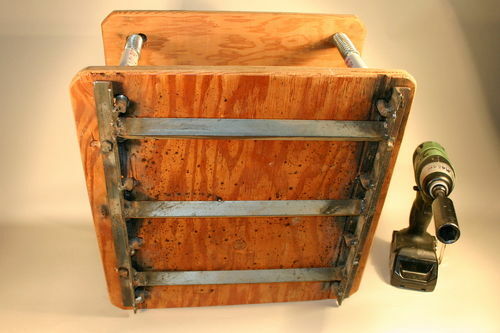 This version has a welded metal lattice that keeps the all-thread from turning and strengthens the bottom plywood. This shot demonstrates a 2×8 wooden cull added on top of the box top to make it easier to tighten in the press. So now you can tighten the nuts with the impact driver and let the glue dry. Sure, you could use a ratchet wrench, but the impact driver is so much cooler and faster. I usually start at opposing corners and then move in and do a final re-tighten. 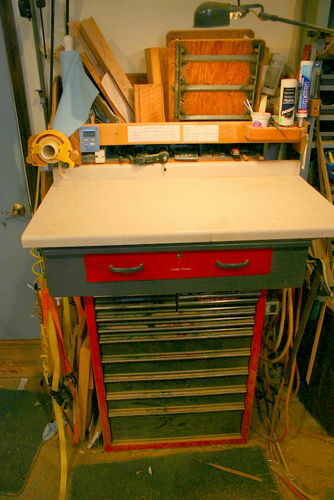 When the press is not being used, the press and some culls are stored on the shelf above the glue-up table. Awesome idea. Thanks for posting. Great idea on the press. It is like having a caul that covers the entire top and bottom… you are a clever man! Just what I needed, thanks for this tutorial big Al, is there ever anytime that you would use a .45 mitered top? The reason I ask is because I was at one of our local woodworkers meetups and the organizer also a class teacher demonstrated all sides, bottom and top mitered. Good blog! Your clamp appears to function well. Thx for sharing it with us. That’s a very clever idea. You’ve eliminated a lot of clamps! 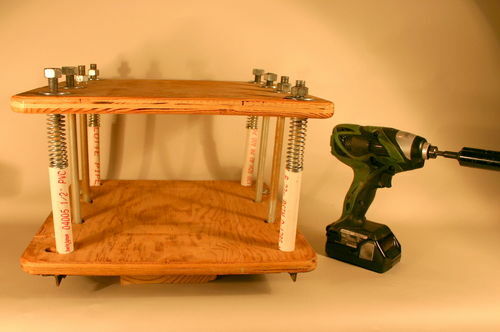 Good design Big Al…You have designed alot of creative jigs for making your work easier and faster. I like the inovative use of springs to aid in efficiency! And the metal reinforcement for keeping pressue equal. Blackie, your question is would I ever use mitered top? 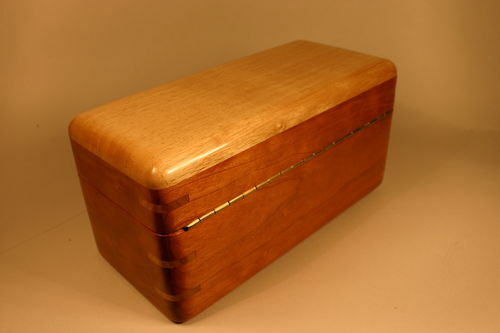 I just finished making some boxes of African Mahogany Crotch grain and wanted to have the grain wrap around the box from back to front instead of from side to side. Now you need to know that this takes a very wide board… nearly 18 inches…but I had that kind of wood and board. I think the Brit Box Maker uses this 45 technique in his EZ box method too. 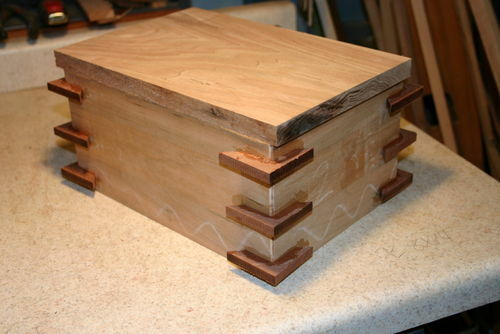 Aside from that, I can see any advantage in this joinery and it takes a lot of extra work to make this type of joint. Big Al that makes perfect since, I guess you could use this technique if you combined (joined) two together or maybe a center piece of different wood or two outer pieces. Randy, this is an example of just what you are talking about. 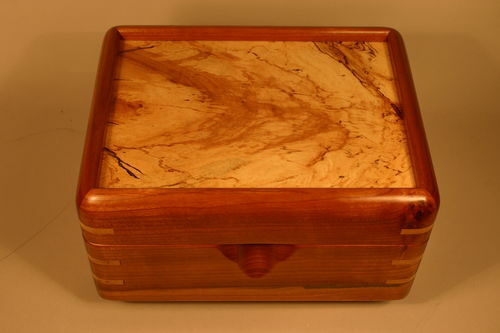 A center-matched piece in an inset box top. It can be quite effective visually. I would guess the instructor is using some version of the EZ box method seen here by the Brit Boxmaker. That is a fine press. Ingenious! 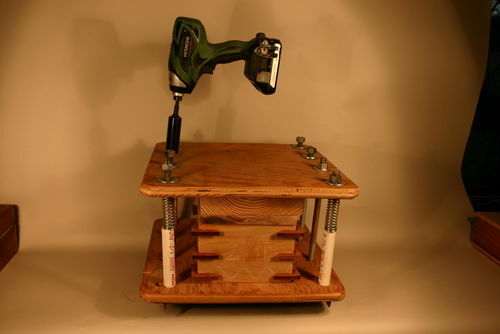 such a great idea, I like the use of the impact driver because it has built in torque stop to clamp evenly. -- Money: if you do not have fun earning it, have fun spending it, I do not enjoy spending it so I have fun earning it. 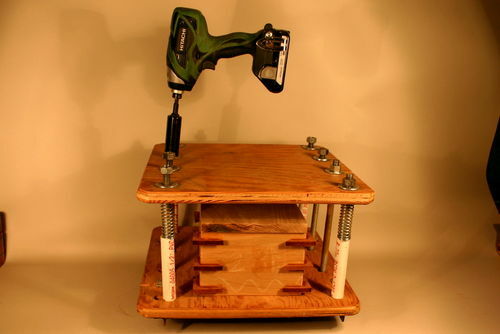 Great idea, there will be a box clamp in the shop very soon. Thanks for sharing. Hey Box guy! I am trying your box making method today. I have a few obstacles, like its 4 degrees and snowing, but other than that i am rolling. Quick question: When gluing on the top and bottom, what is your method for keeping the glue out of the interior of the box? For example, I have two box carcasses right now that are just sides with no top or bottom. I made a top and bottom for one of them. Brought them inside and glued them up. But I fear when I cut the box in half, there will be a lot of glue run-off inside the box that will be difficult to sand/get rid of. How do you do it?